You’re on Wedding Anniversary Wishes. See menu at bottom of page. 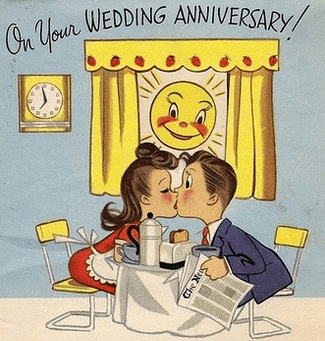 Here’s the collection of wedding anniversary wishes that will give you ideas for writing personal personal messages for your husband, wife or significant other. I love you and promise to continue doing so forever. Happy anniversary! For all this time I have been putting this puzzles of my life, then I realized, the last piece is you. I’ve fallen in love many times – always with you. Home is wherever I’m with you, my sweet! To old memories and ones yet to make! Congrats and Bravo! This love story has no ending. Happy Anniversary! Another year, another cause for wild celebration! Hip, hip, hurray! Thanks for being the best partner I could ever dream of. Happy Anniversary! You’ve made my dream come true for ___ years! Walking down the aisle with you was great, but it’s even better to walk with you through life. You’re the best! I feel like I’m on top of the world when I’m with you. So many years and I wouldn’t change a thing. Today, as with every day, you’re my everything! Happy Anniversary! I only want to be with you twice — now and forever. And now, more than ever, I love you. Because I Still Love You Bunches! You are everything and more. Thanks for being the best husband ever! Marrying you was the best thing I ever did! We’re in this love together – and it’s working better than ever! To me, you are perfect! Happy Wedding Anniversary. I feel invincible with you. Thanks for all you do for me and Happy Anniversary. Our anniversary is a time to celebrate the joys of today, the memories of yesterday and the hopes of tomorrow. I fall in love with yet again and again, day after day. You are the best thing that ever happened to me! Our love burns brighter day after day, year after year. Happy Wedding Anniversary. You didn’t have to be so nice; but it sure made it easy. Happy Anniversary my Love. Happy Anniversary to the gal who can still make me feel like the luckiest guy in the world. If I had to do it all over again, I would — but I’d probably marry you earlier! You’re my love, inspiration and best friend. Each year gets better and better. Love you now more than ever – Happy Anniversary! X years down & forever to go, Happy Anniversary! After all this time, you are still amazing to me. The first time I set eyes on you, I envisioned a life together. It’s been grand. With you I found that person that would do anything for me. I love you more than ever and Happy Anniversary. From the first time we met, I knew we were meant to be. Thanks for loving me just the way I am. Happy Anniversary. I am truly blessed to be married to my soul mate – I love you. X years ago, God created a beautiful marriage. Today is a celebration of His love and yours. Happy Anniversary. A little something to let you know that I think about you all the time. A wish on your first anniversary that all your days together may be touched with lasting love. After all these years, you’re still amazing. After all this time, you are still incredible. Happy Anniversary. All mine, All the time. Happy Anniversary! Being married to you means that my best friend is always there. Love you Lots! Happy Anniversary! Every Day I Give Thanks That You Chose To Spend Your Life With Me. From The Bottom Of My Heart And The Depths Of My Soul, With Love. From My Heart To Yours, With Love. From the first time we met, I knew there was something very wonderful and unique about you, something that reached out and drew me to you completely. You’re my husband, my partner, my friend and the love of my life. Happy Anniversary to my very best friend. God Gave Me The Best When He Gave Me You. Happy 1st Anniversary. Looks like marriage really agrees with you two! Happy 20th Anniversary. May the cherished memories of the twenty years you have shared make this anniversary a wonderful celebration. Congratulations. Happy Wedding Anniversary wishes to my always from your forever. Happy Anniversary to my loving hubby. Thank you for the last 11 yrs. and many more years to come. Still didn’t find any Anniversary Wish you like? Try to create your own. Below are some synonyms for words might use to craft your own message. Words associated with “romance and love”: affection, appreciation, devoted, devotion, enchanted, fondness, infatuation, passion, tenderness, yearning, amour, ardor, cherish, crush, delight, enjoyment, flame, partial, relish, sentiment, romantic, have a soft spot for, mad for and lovely. Words associated with “romantic interest”: crush, dove, bird, sweetheart, best friend, admirer, companion, sweet, sugar, lovely, my love, honey, darling, girlfriend, boyfriend, hubby, heartthrob, lover, paramour, beau, dear, beloved, flame, pet, lovebird, steady, swain, treasure, valentine, significant other, and one and only. You’re on our Wedding Anniversary Wishes page.